Will you go with me now? This note must be twenty years old, found while I was going through old boxes. I find it hard to believe I would have written him a note (wouldn’t I have received the note back with the appropriate box checked? ), so my friends probably asked for me. I don’t remember Jeff or wanting to go with him! Jeff, you’ve been recycled. Comment on my blog if you want to go with me now. 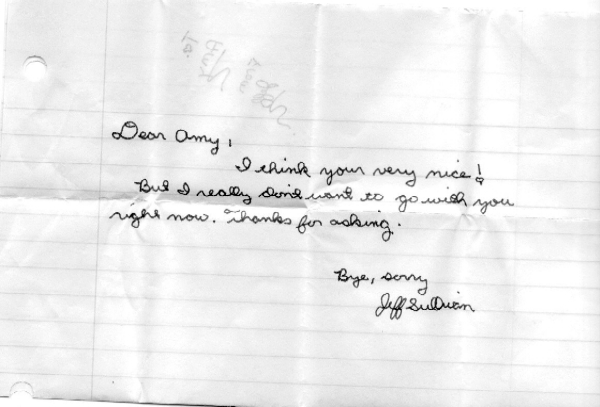 You can see through to the other side that Mr. Sullivan wrote “To: Amy” with a heart in the place of the “O”. I think that’s totally leading you on. I can just picture little Amy in pigtails opening the note with joy, thinking the heart on the “To: Amy” is foreshadowing of great things to come. But alas, heartbreak! What a cad, that Jeff Sullivan is. Next time I see him cruising the strip I’ll give him a good thrashing. That’s the funniest thing I’ve seen in ages! Thanks for the smile!